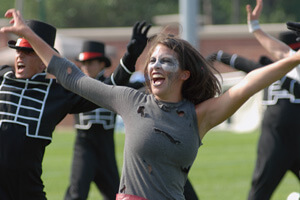 A Velvet Knights guard member dances to Thriller in 2008. Hundreds of thousands of dedicated fans paid their respects to the King of Pop, Michael Jackson, today in what has been called the biggest celebrity send-off of all time. Michael Jackson, who passed away on June 25 at the age of 50, has had and impact on the world of music so pervasive that stages all over the world have been influenced by his hits. Even the drum corps arena has featured his Grammy Award-winning, generation-crossing fixtures of pop culture. Drum corps fans have heard bits of Jackson's music on several occasions. The Bluecoats included musical quotes from "Smooth Criminal" as part of their 2007 production, "Criminal," while the Velvet Knights delighted crowds with their program, "The Inferno" in 2008, which included an arrangement of Jackson's title track from best-selling album of all time, "Thriller." Drum corps' repertoires have been stacked with Jackson's hits long before the new millennium, however; his influence has stretched over two decades. Beginning as early as 1985 with the Marquis Drum & Bugle Corps of Fond du Lac, Wis. performing the Michael Jackson, Stevie Wonder and Lionel Richie classic, "We are the World," Jackson's mark on pop culture and the drum corps activity is undeniable. The 1987 Bridgemen played the Jackson Five's "Oh Baby Give Me One More Chance," and Impulse played Jackson Five's "I Want You Back" in their 1999 production, "Kool Vibes." After learning of Jackson's passing the day before, fans at the DCI Central Illinois event in Normal, Ill., on June 26, were willing to show off their favorite dance moves in tribute to the pop icon. Check out the video on the DCI Fan Network.